Before moving to Australia, I employed a domestic helper from Philippines because my life was hectic and I felt too tired to cook any meals after busy work. Interestingly, I haven’t tried my domestic helper’s hometown cuisine. Maybe she thought that we wouldn’t be interested. This dish looks very easy and simple. So I tried to use Adobo to cook with pork chops. Our family was very satisfied with its taste. 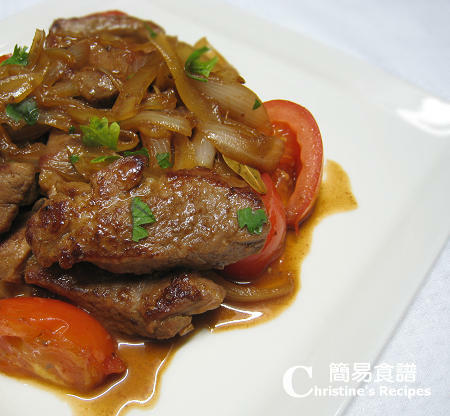 The sauce is sweet and sour in taste with authentic oriental flavour. Best served with rice. Rinse pork chops and drain well. Cut into smaller pieces and marinate for at lease 25 minutes. Heat oil in wok or frying-pan. Cook pork chops until both sides are lightly brown. Push pork chops to sides of frying-pan. Add onion and garlic in the middle. 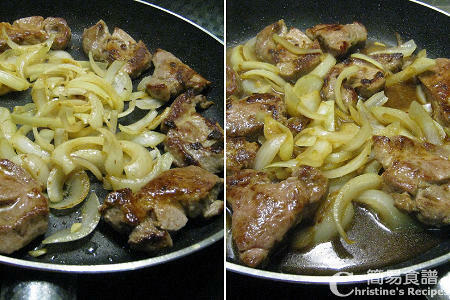 Sauté until tender and brown, around 2 to 3 minutes. Pour in seasonings. Bring it to a boil. Slower the heat to low, and cook for 15 minutes with a cover, until sauce thickens. Add brown sugar and stir until completely dissolves. Toss in tomato and cook for a while. Sprinkle parsley or spring onion. Serve with hot white rice. hey, another adobo dish! love it..